In this lesson, we will learn how to find the position of the center of gravity (mass) of a standard uniform plane lamina. Where does the center of gravity of a fine rod, 𝐴 𝐵 , of uniform density lie? A uniform lamina is bounded by the parallelogram 𝐴 𝐵 𝐶 𝐷 . 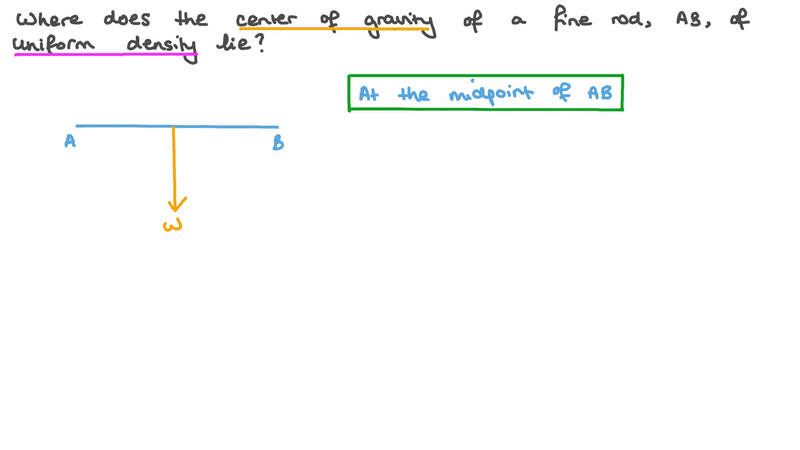 Where does its centre of gravity lie? Where does the centre of gravity of a uniform triangular lamina lie? A uniform rod 𝐴 𝐵 𝐶 of length 46 cm was bent at its midpoint 𝐵 then suspended freely from 𝐴 . Given that 𝐵 𝐶 is horizontal when the rod is hanging in its equilibrium position, determine the distance between the centre of gravity of the rod and 𝐴 . Where does the center of gravity of a uniform circular disk lie? A uniform rod 𝐴 𝐶 of length of 36 cm was bent from point 𝐵 , where 𝐴 𝐵 = 3 6 5 c m , and 𝑚 ∠ 𝐴 𝐵 𝐶 = 9 0 ∘ . The rod was then suspended freely from 𝐴 . Find the tangent of the angle that 𝐵 𝐶 makes to the horizontal. Two uniform rods, 𝐴 𝐵 and 𝐵 𝐶 , of lengths 𝑥 and 𝑦 , respectively, are connected at 𝐵 . When the system is suspended from 𝐴 and settles in its equilibrium position, 𝐵 𝐶 is horizontal. Given that 𝑦 = 1 3 6 𝑥 , determine 𝑚 ∠ 𝐴 𝐵 𝐶 rounding your answer to the nearest minute if necessary. A uniform lamina of mass 𝑚 is in the form of a rectangle 𝐴 𝐵 𝐶 𝐷 in which 𝐴 𝐵 = 4 8 c m and 𝐵 𝐶 = 1 2 8 c m . The corner 𝐴 𝐵 𝐸 , where 𝐸 is the midpoint of 𝐴 𝐷 , was cut off. The resulting lamina 𝐵 𝐶 𝐷 𝐸 was freely suspended from the vertex 𝐶 . A weight was placed at point 𝐷 which caused 𝐵 𝐶 to be inclined at 4 5 ∘ to the vertical. Find the mass of the weight placed at point 𝐷 expressing your answer in terms of 𝑚 . A uniform lamina is shaped as a parallelogram 𝐴 𝐵 𝐶 𝐷 such that 𝐴 𝐵 = 3 4 c m , 𝐴 𝐷 = 2 3 c m , and ∠ 𝐵 𝐴 𝐷 = 6 0 ∘ . The lamina was suspended from the point 𝐸 on 𝐷 𝐶 which causes 𝐴 𝐵 to be horizontal when the lamina is hanging in its position of equilibrium. Find the length of 𝐸 𝐷 . A uniform square lamina 𝐴 𝐵 𝐶 𝐷 has a side length of 48 cm. A circular hole of area 256 cm2 was drilled into the lamina. The centre of the circular hole lies on the diagonal 𝐵 𝐷 and divides it into a ratio of 5 ∶ 1 from 𝐵 . The lamina was suspended freely from point 𝐴 until it reached a state of equilibrium in a vertical plane. Given that the angle of inclination of side 𝐴 𝐵 to the vertical is 𝜃 , determine t a n 𝜃 . A uniform triangular lamina 𝐴 𝐵 𝐶 is right-angled at 𝐵 , 𝐵 𝐶 = 1 7 c m , 𝐴 𝐵 = 1 7 c m , and 𝑋 , 𝑌 , and 𝑍 are the midpoints of 𝐴 𝐵 , 𝐵 𝐶 , and 𝐶 𝐴 respectively. Triangle 𝐶 𝑌 𝑍 was cut off and then affixed to the lamina above triangle 𝑌 𝐵 𝑋 . The body was freely suspended from point 𝐵 . Find the tangent of the angle that 𝐵 𝐶 makes to the vertical, t a n 𝜃 , when the body is hanging in its equilibrium position. Find the position of the centre of mass of the uniform lamina 𝐴 𝐵 𝐶 , which is in the shape of an equilateral triangle. A uniform triangular lamina has vertices 𝐴 ( 7 , 1 ) , 𝐵 ( 9 , 3 ) , and 𝐶 ( 8 , 5 ) . Find the coordinates of its centre of mass. Two uniform lamina made of the same material are joined together to make one body. The first is a rectangle 𝐴 𝐵 𝐶 𝐷 where 𝐴 𝐵 = 1 6 c m and 𝐵 𝐶 = 7 c m , and the second is an isosceles triangle 𝐶 𝐸 𝐷 where 𝐷 𝐸 = 𝐶 𝐸 = 1 7 c m and vertex 𝐸 lies outside of the rectangle. Find the coordinates of the centre of gravity of the lamina, given that rectangle 𝐴 𝐵 𝐶 𝐷 is in the first quadrant, 𝐵 is at the origin, and 𝐶 is on the 𝑥 -axis. The uniform lamina 𝐴 𝐵 𝐶 𝐷 is a rectangle where 𝐴 𝐵 = 4 8 c m , 𝐵 𝐶 = 6 4 c m , and 𝐸 ∈ 𝐴 𝐷 such that 𝐴 𝐸 = 4 8 c m . The corner 𝐴 𝐵 𝐸 is folded over along the line 𝐵 𝐸 such that the side 𝐴 𝐵 meets the side 𝐵 𝐶 as shown in the figure. Find the coordinates of the centre of mass of the lamina in this new shape. The given figure shows a uniform lamina bounded by a square of side length 4 cm. It is divided into nine congruent squares. If square 𝐸 is cut off, find the coordinates of the centre of gravity of the remaining part. A uniform lamina in the form of an equilateral triangle of side length 24 cm has a mass of 298 g. A mass of 149 g is attached to the lamina at one of the trisection points of 𝐴 𝐵 as shown in the figure. Determine the coordinates of the system’s centre of gravity. A uniform lamina in the form of a square 𝐴 𝐵 𝐶 𝐷 of side length 28 cm has a mass of 54 grams. Masses of 10, 8, 4, and 8 grams are fixed at 𝐴 , 𝐵 , 𝐶 , and 𝐷 respectively. Find coordinates of the centre of mass of the system. A uniform rectangular lamina has a length of 63 cm and a width of 59 cm. It is divided into three equal sized rectangles along its length, the last of these rectangles has been folded over so that it lies flat on the middle rectangle as show in the figure. Find the coordinates of the centre of gravity of the lamina in this form. A uniform square lamina 𝐴 𝐵 𝐶 𝐷 has a side length 𝑙 . Another uniform lamina 𝐵 𝐶 𝐸 of the same density, shaped as an isosceles triangle, is attached to the square such that 𝐸 lies outside the square and 𝐵 𝐸 = 𝐶 𝐸 . Given that the square’s side length is 5 3 times the length of the triangle’s height, find the centre of mass of the system. A uniform lamina 𝐴 𝐵 𝐶 𝐷 of mass 41 grams is shaped as a rhombus, where 𝐶 𝐴 = 1 0 c m and 𝐵 𝐷 = 2 9 c m . Masses of 36 g, 15 g, 18 g, and 30 g are fixed at the midpoints of 𝐴 𝐵 , 𝐵 𝐶 , 𝐶 𝐷 , and 𝐷 𝐴 , respectively. Find the distance between the midpoint of the rhombus and the centre of gravity. A uniform lamina is shaped as an equilateral triangle of side length 45 cm. What is the distance between the centre of gravity and one of the vertices of the triangle? The figure shows a uniform lamina that is symmetric about 𝐶 𝐷 . Given that 𝑙 is the distance from 𝐴 𝐵 to the centre of gravity of the lamina, which of the following is true? The diagram shows a uniform plane figure. Given that the grid is composed of unit squares, find the coordinates of the figure’s centre of mass.